Representatives from the WNYREDC attended Governor Cuomo’s Regional Economic Development Council’s Round III Summit yesterday in Albany. The representatives included Co-Chair Howard Zemesky (Larkin Development), Christina Orsi (Empire State Development), Brenda McDuffie (Buffalo Urban League), Deanna Brennen (Niagara USA Chamber), Aaron Bartley (PUSH), Laura Quebral (UB Regional Institute) and Michael Ball (Empire State Development). 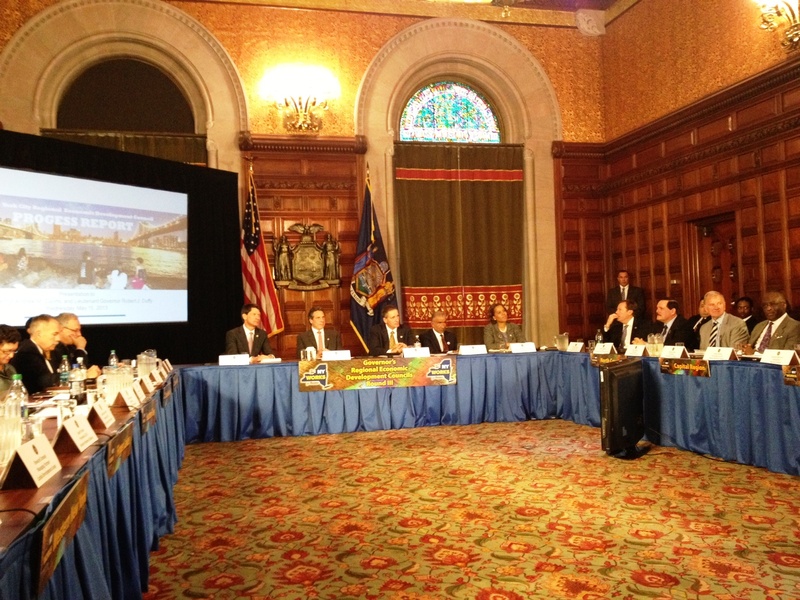 Each of the ten regions presented an update on their strategic plans to Governor Cuomo and the Governor announced Round III of the CFA process including new initiatives for this year. Below is the press release. Governor Andrew M. Cuomo today kicked off round three of the Regional Economic Development Council (REDC)s, hosting council co-chairs and local economic development officials in Albany to detail the third round of the process and officially launch the 2013 competition. The REDC and Consolidated Funding Application (CFA) process have transformed economic development in NYS, creating a statewide framework for bottom-up regional economic growth. Statewide, the first two rounds included $1.5 billion in investments to support more than 1,400 projects, and creating or helping retain an estimated 75,000 jobs. Western NY: REDCs have delivered $153.1 million for 154 projects in Western New York. Finger Lakes: REDCs have delivered $165 million for 169 projects in the Finger Lakes region. Central NY: REDCs have delivered $197.5 million for 147 projects in Central NY. Southern Tier: REDCs have delivered $140.5 million for 120 projects in the Southern Tier. North Country: REDCs have delivered $193.4 million for 152 projects in the North Country. Hudson Valley: REDCs have delivered $159.8 million for 145 projects in the Hudson Valley. Mohawk Valley: REDCs have delivered $119.2 million for 129 projects in the Mohawk Valley. Capital Region: REDCs have delivered $113 million for 172 projects in the Capital Region. New York City: REDCs have delivered $117.6 million for 100 projects in New York City. Long Island: REDCs have delivered $161.3 million for 152 projects on Long Island. $220 million ($150 million in capital + $70 million in tax credits) for competition. $540 million for state supported programs through the CFA process. All ten regions will compete against each other. Five regions identified as “top performers” will receive $25 million each and the remaining will compete for the balance of $25 million. Each region is also eligible for up to $10 million in tax credits. Identification of transformative projects that support collaboration (e.g. leveraging computing assets to establish research partnerships; utilizing equipment and co-locations to assist manufacturers; and developing shared-space for food processing). Application materials will be available by June 3rd. The CFA will open to applicants on June 17th and submissions from the regional councils are due September 24th. The Governor today unveiled the Innovations Hot Spots Competition that will promote the commercialization academic research and grow the state’s economy. Under the competition, REDCs will put regional incubator plans together that foster innovation by offering startups low-cost and support to help commercialize academic research. The Innovation Hot Spots Competition is designed to make New York State a leader in attracting venture capital and industry-sponsored research spending: Currently, New York’s universities rank 2nd nationally (California is 1st) in total research dollars spent. However, New York attracts only 4% of the nation’s venture capital while California attracts 47%. New York ranks only 22nd in the nation in industry-sponsored research compared to North Carolina which is 1st. Demonstrate a connection with a higher education institution and have the ability to transition technology from lab to marketplace. Demonstrate a link to regional sources of innovation and expertise. Provide industry accepted best practice services. Agree to maintain and operate program for three years and generate a 2:1 match to the state grant for support services. Winning incubators will receive financial support services from the state, including legal, technical and business support services. Up to five winning incubators will be accepted this year, and five in 2014. As part of Governor Cuomo’s efforts to improve the state’s economic development model, a NYS Consolidated Funding Application (CFA) was created to streamline and expedite the grant application process. The CFA process marks a fundamental shift in the way state resources are allocated, ensuring less bureaucracy and greater efficiency to fulfill local economic development needs. The CFA serves as the single entry point for access to economic development funding, ensuring applicants no longer have to slowly navigate multiple agencies and sources without any mechanism for coordination. Now, economic development projects use the CFA as a support mechanism to access multiple state funding sources through one application, making the process quicker, easier, and more productive.